If you want your team to win a championship, you better hope your team's general manager views his roster like a bucket rather than a collection of talent. There are other factors that are intangible, like character and compete level. But when the salary cap puts the lid on the bucket, all the intangibles in the world won't make up for large chunks of wasted space. Jim Rutherford has done a great job of maximizing the space in the bucket during the last two seasons. The signings and trades that followed last year's Stanley Cup championship aren't less significant than the player movement in 2015-16. In fact, the last player the Penguins traded for this past March 1st is a perfect example of it. Mark Streit cost the Pens no more than a fourth round pick in 2018. The real beauty of the deal rests with the fact that Rutherford went through the Tampa Bay Lighting to get him out of Philadelphia. That alone makes the trade a "delightful" (for you WWE fans) troll job. Add in the fact that both Philly and Tampa retained salary in the two trades, and the end result has to produce a wry smile from the most jaded Penguins fan. Ron Hainsey, falls into a similar general category as he was scooped up for a second round pick in 2017, and Carolina also agreed to retain salary for the deal to be consummated. Whether you think Streit and Hainsey have been appropriately used or have had enough tangible impact to justify the cost of each player is legitimate food for discussion. However, with 13 wins under the Penguins belt and the glaring absence of Letang ever present, it can't be argued that they've augmented a depleted Penguin's defense in a satisfactory manor. Their combined cap hit of roughly 3.2 million is a perfect example of an attempt to maximize the space in the bucket. And when that number is put in the perspective of a last-minute necessity back in March, those deals should be viewed in the same vein as the five major trades that were made during the 15-16 season. With that being said, I don't think Rutherford is above criticism. His decision to sign Brandon Sutter to a two-year 3.3 million deal when he first arrived in mid-2014 might be evidence item number 1. The problem with this train of thought is not the awareness of the problem, but his conclusion on how to solve it. If he ends up signing guys in the Tom Wilson/Tanner Glass model, he has reverted back to the questionable roster decisions that doomed many Ray Shero built teams with the likes of Aaron Asham. I'm hopeful that Rutherford has a more creative solution, and to Rutherford's credit, the fix to the Brandon Sutter mistake was nothing if not creative. Selling Vancouver on Brandon Sutter's "leadership skills" (insert eye roll here) and replacing him with Nick Bonino should only be second to swapping Trevor Daley for Rob Scuderi. Is Bonino perfect? No. But 40-year-old Matt Cullen, who Rutherford signed in 2015, has augmented Bonino's responsibilities in a traditional third line (shut-down) role. Hence, why the HBK line was given so much freedom offensively in last season. The total cost for for Bonino and Cullen was 3.7 million combined in 15-16 and 3.9 this year. The key to Rutherford's ability to fill the bucket has been his focus on maximizing the strengths of his best stars. Because of this, there hasn't been a need for guys like Tanner Glass anymore. "The league always moves in cycles. And there’s not just one way to win." This speaks to the mind of a thinker who is aware that different roads can lead to the ultimate destination. His predecessor, while stronger in areas such as maximizing the return on a given trade, lacked this quality. 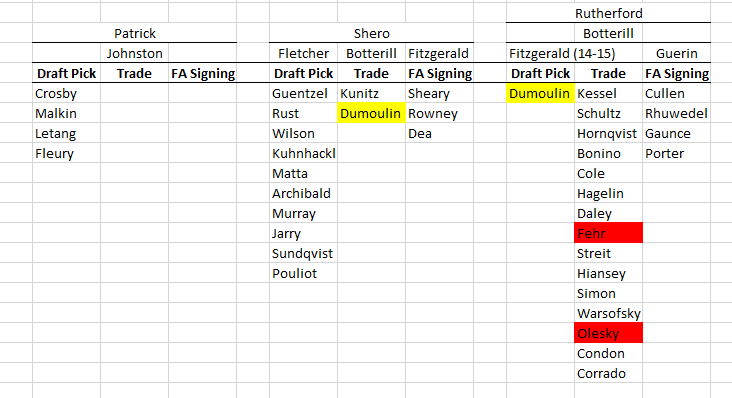 And it isn't particular to Shero as many teams are built around the principle of trying to create a roster which can adapt to a given style of play. Whether it be size-based intimidation, skill, or structural discipline. There is an inherent flaw in this type thinking that Rutherford is aware of. The idea that if you try to be good at everything you will be great at nothing, holds true because flaws always remain as one moves from one style or image to another. That is why Rutherford's version of the Pittsburgh Penguins has been so good and why the quote above makes me skeptical at best, and concerned at worst. Ultimately what Rutherford seems to realize is that if the foundational pieces of a team are "high-end," the key is to create a structure around them that doesn't minimize their flaws, but increases the intensity of the light coming from their strengths. In a metaphorical way it's the best way to counter the darkness. To help with this, the coach he hired as his Plan B back in 2015 is as good of a manager of people and circumstance as he is "in game" and "game to game" adjustments. All of those factors have maximized the space in the bucket for a second straight year and hopefully for three more wins this year (knock on wood). No general manager is perfect but Rutherford is creative as well as experienced, and it has paid off thus far. It's safe to say that Penguins fans hope it continues.